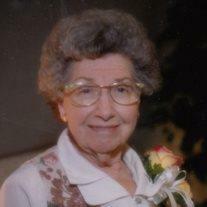 Mona LaRee Millett Lofgreen, 94 years of age, passed away March 31, 2014 in Mesa, Arizona. She was born to Artemas T Millett and Hazel Casa Pomeroy Millett in Mesa on May 14, 1919. She was the second of three children with an older brother Max and younger brother Keith. She married Torry Dana Lofgreen on June 23, 1942. They have 11 children: Torry Lofgreen, Jr. (Stephanie); Jana Porter (Dale); Marsha Russell (Keith); Carol Robertson (Gary); John Lofgreen (Jill); Peggy Wooden (Bob); Art Lofgreen (Jacquie); Donna Lofgreen; Kim Lofgreen (Amy); Chris Lofgreen (Jenni); and Missy Gardner (Corby). They have 64 grandchildren, and 126 great grandchildren. Mona was preceded in death by her husband, Torry Lofgreen, Sr.; daughter, Carol Robertson; brother, Max Millett; and parents. Mona, a great lover of music, graduated from the University of Arizona with a bachelor’s degree in Music. She taught music for a short time in the Mesa Public Schools and piano for many years. She had a great love for drama, acting in many plays in high school and in the Mesa Little Theater where she met her sweetheart, Torry. Mona was a member of the Church of Jesus Christ of Latter-day Saints and was most remembered for her love of the Savior, her kindness and cheerfulness, and many acts of service. A viewing will be held Friday, April 4, 2014, 6-8 PM at the Parkcrest Ward, 3920 E. Brown Rd., Mesa, Arizona. Funeral services are Saturday, April 5, 2014, 11:30 AM at the Parkcrest Ward, preceded by a family viewing at 10:30 AM. Arrangements by Bunker’s Garden Chapel.